When sourcing a new press brake the buyers goal should be to match the equipment to their expected requirements and use, plus get the best value for their investment. This means obtaining an excellent quality product with proper features at an affordable cost. Also, just looking at initial cost can sometime be deceiving as lifecycle costs should be accounted for that includes maintenance costs and efficiency of labor in using the press brake. Hydraulic press brakes began replacing mechanical ones in the 70s due to costs and safety issues. Mechanical components were replaced with a hydraulic system which eliminated these costly machined parts. Of course, incorporating a superior hydraulic system with quality components is paramount to supplying reliable and accurate equipment for the end user. The buyer should also ask if valves, rings, seals and other key hydraulic components are readily available and if the company they are buying from has a good after sales service staff. Proprietary parts are often difficult to find or can take a while to obtain. Press brakes, like all machines, have features that differ across the various manufacturers. 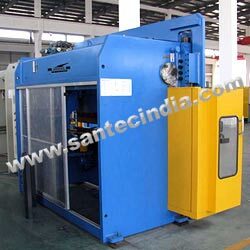 The back gauge is a feature that is generally not included with this machine as standard equipment even though it is extremely useful. This gauge is typically sold as an option. This is true also for tooling as well. There are specialty tooling companies that sell after market press brake tooling for all types of press brake jobs. Yet, a savvy buyer will be able to negotiate a front operated power back gauge and tooling package to be included with their press brake purchase. If the supplier is on the cutting edge he will have either American or European style tooling to offer to the customer. The buyer also needs to be certain that whichever press brake they purchases that it is flush floor mounted. Many of the 150 and 176 ton machines on the market require a slot in the floor to accommodate the apron that hangs from the front end of the press brake. Sometimes the photo in a catalogue does not pick up this issue. Ask your sales person so that you dont become surprised and pay a lot more money for this type of foundation.